He was struggling in his Life. He wanted to achieve what he had dreamt of, but he did not have that special someone to share his success with. Therefore, his efforts lacked conviction. He met her by accident and there was an eye contact. She immediately knew he was the one. For him, he just could not look beyond her eyes and those eyes became his reason to live, his reason to work, his reason to dream and achieve big. His life, now had a purpose. She accepted him the way he was. She was not interested in his past. The bond was instant and deep. A few years later, the man's dreams were realized. He had made it to the top. And the eye contact lasted forever. If you carefully see, tow lines or pipes to whom I was referring as him and her, enter the frame from the left against a red wall, red meaning struggle. The closeness of the two pipes depict the trust they had in each other. Once they traveled some distance together towards the right of the frame, they took that giant leap together by moving upwards, which was a result of her conviction in him. He generally used to look for a safety rope before climbing a mountain. She was his safety rope. He knew this time that all the risks he shall take will pay off. Well, the general perception today is, where there is money all is merry. But they forget that one cannot buy love. Their perception is wrong. In fact it is the other way round and I quote: "Once there is love, everything else eventually falls in place". The composition is Minimalism as Simple Geometry i.e Lines. I sat down on my knees and went very close to the subject. Light was poor, so I increased the ISO a bit. I actually took this shot horizontal but ended up posting it as a vertical one. I flip-flopped it about 18-20 times to see at what point do the lines connect the most to my sub-conscious mind. Going upwards was the answer. It is a very simple composition with lots of negative space. 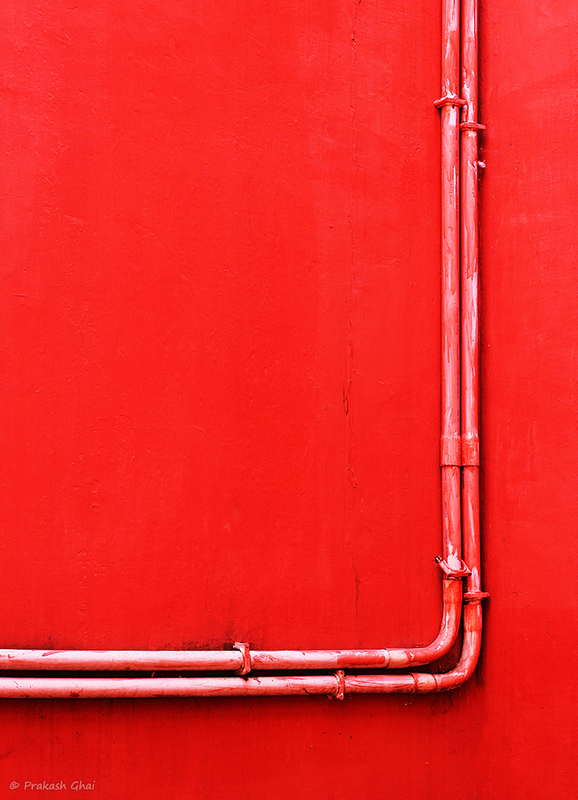 Remember to look for pipes against colored walls the next time you go to a mall or a shopping complex or even a friend's house. I love this photo. I like a lot your minimal images.